After more than 25 years of use, PCR remains a workhorse in molecular biology. New applications, new reporter chemistries, and advancing microfluidics will usher in higher throughput and more sensitive PCR techniques, believes Salvatore Marras, Ph.D., and professor, Public Health Research Institute, University of Medicine and Dentistry of New Jersey, and a speaker at Select Biosciences’ recent “Advances in qPCR” conference. “I think the future will include microfluidics where you’ll probably do more than 3,000 or 10,000 PCR reactions simultaneously in a microwell,” said Dr. Marras, whose own talk—The Bright and Dark Sides of Fluorescent Nucleic Acid Hybridization Probes—surveyed the broad landscape of probe design and selection of appropriate fluorescent reporter chemistries. A powerful PCR technique for use in profiling cancer tumors—LNA-Enhanced Real-Time Ice-COLD-PCR and High Resolution Melting for Ultra-Sensitive Detection of Low-Level Lung Cancer Resistance Mutations—was presented by Mike Makrigiorgos, Ph.D., director biophysics laboratory and medical physics division, Dana Faber Cancer Institute, Harvard Medical School. The problem addressed by Ice-COLD-PCR and COLD-PCR (the original advance that lead to Ice-COLDPCR) is that clinical cancer samples are never pure, but they are always mixed with normal, wild-type cells. “Ice-COLD-PCR provides a unique method for detection of low-level mutations—for example, mutations below 5 percent mutant to wild-type alleles—because it magnifies subtle mutations during PCR amplification such that following PCR they can easily be identified,” explained Dr. Makrigiorgos. Ice-COLD-PCR, an advance over COLDPCR, stands for improved and complete enrichment of mutations via co-amplification at lower denaturation temperature PCR. A full explanation was published by Dr. Makrigiorgos and colleagues in Nucleic Acids Research, 2011, Vol. 39, No. 1. In brief, it combines elements of fast COLD-PCR and full COLD-PCR as explained in this excerpt from the paper: “… to enrich all mutation types, Ice-COLDPCR employs a reference sequence (RS) of a novel design; the RS is engineered such that (i) it matches the WT-sequence of the antisense strand; (ii) PCR primers cannot bind to it; and (iii) it is phosphorylated on the 3′-end so that it is nonextendable by the polymerase. “The unique aspect of COLD-PCR is that there is no need of a priori knowledge as to the type and position of a mutation. All mutations are magnified irrespective of their position on the sequence. Accordingly, following Ice-COLD-PCR one may apply direct sequencing to the PCR product to identify the type and position of the mutation,” said Dr. Makigiorgos. While reliable NGS for DNA with highprevalence tumor somatic mutations has been demonstrated, Dr. Makigiorgos noted the required “depth” of sequence interrogation remains a problem, and detection of low-prevalence somatic mutations at levels below ~2–5% in tumors with heterogeneity, stromal contamination, or in bodily fluids is fraught with false-positives irrespective of coverage. “We intend to establish massively parallel Ice-COLD-PCR to enrich mutant sequences prior to their screening via nextgeneration sequencing, thus enabling ultradeep NGS while also retaining accuracy, reliability, and high-throughput capability,” said Dr. Makigiorgos. The new approach has already been adopted by several groups worldwide and is being used for diverse applications that include: cancer-based molecular diagnosis, prenatal diagnosis, plant/crop genetics, and infectious diseases. Biophysicist Peter Carr, Ph.D., a research scientist in MIT’s Media Lab’s Center for Atoms and Bits, presented work—qPCR Methods for Re-Engineering Microbial Genomes: Creating a New Genetic Code—in which a novel multiplexed qPCR approach is helping MIT researchers re-engineer the E. coli genome. 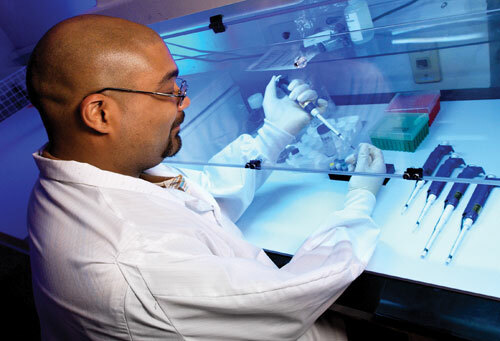 The broad project involves investigating methods for effectively modifying genomes. Along with Farren Isaacs, Ph.D., then working in George Church’s Lab at Harvard, Dr. Carr collaborated on MAGE (multiplexed automated genome engineering), a method that simultaneously targets many locations on the chromosome for modification in a single cell or across a population of cells, thus producing combinatorial genomic diversity. Normally, multiplexed PCR means you are performing up to four PCR reactions in parallel. Each reaction releases a different fluorophore to be detected on a different optical channel. This typically requires a combination of expensive reagents and highly optimized reactions, noted Dr. Carr. Obtaining a sufficient amplicon size is important in detecting DNA damage. Ziping Zhang, Ph.D., research assistant professor, Texas State University, presented a novel, fast, and precise real-time extra long-PCR (XL-PCR) assay for DNA damage detection based on introducing SYTO-82 to TaKaRa LA Taq™ hot start system as the fluorescence reporter. “The primary problem solved by RT XL-PCR in this application is that it incorporates XL-PCR into RT-PCR. Traditional RT-PCR is usually good at quantifying short amplicons (50–300 bp). In the present application, it can be used to detect amplicons as long as up to 15 kb. The toughest part of the procedure to get working well is to establish a good RT XL-PCR condition including primer, reporter dye, polymerase, etc. The overall aim is to get constant amplification efficiency for long amplicons,” explained Dr. Zhang. Currently, this method takes a longer time than normal RT-PCR, but Dr. Zhang expects development of new high-speed Taq shorten the time required.